Seriously? OMG! WTF?DIscovery/TLC Archives - Seriously? OMG! WTF? Food Network announced today who will be competing on the fifth edition of Worst Cooks in America: Celebrity Edition and April 21st cannot come soon enough for me. The celebrities who cannot cook this time around are Jim J. Bullock, Morgan Fairchild, Tonya Harding, Jonathan Lipnicki, Taryn Manning, Alec Mapa, Kym Whitley and Jimmie Walker. 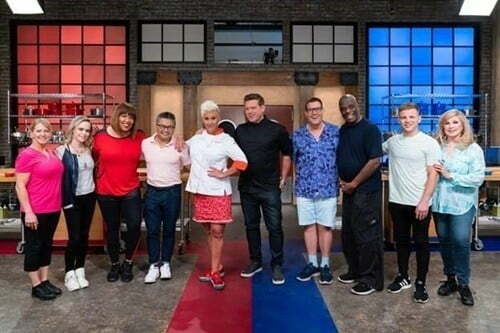 They will once again be mentored by Chefs Anne Burrell and Tyler Florence. There are so many people for me to root for, I cannot pick one. I have great interactions with Manning, Bullock, Whitley, Mapa and Fairchild, and I have had a crush on Walker since I was a kid. Therefore, I can’t decide. The only thing I know is that I will be watching all 7 episodes as they air. Not only because I am rooting for almost all of them, but also because it is my favorite show on the channel. If you have never seen it, then you should catch up on their app. Jerry O’Connell makes out with a dead fish! Back in 2010, Jerry O’Connell had his pen!s bitten off by killer fish in Piranha 3D. Eight years later, he is finally getting his revenge on fishes. He showed them what it is like to have your head is someone else’s mouth. It does not look like fun, does it. Unlike what they did to him, he left their head on! The other night when O’Connell was on Shark After Dark during Discovery’s Shark Week, he did things to a fish that I am only assuming he has done with his wife. Things that will make a person swear off of eating seafood forever. At least it did me. I mean Frenching a raw fish’s head has to taste grosser than doing that other sexual thing you do with your mouth on a hot sweaty day. And I have not sworn off of doing that thing yet. Anyways, here is a O’Connell story for you. Eight years ago, I went to a press screening of Piranha 3D, and then went watch a taping of Jimmy Kimmel Live from the green room with a friend. O’Connell was a guest on the show and he shook hands with everyone that was in that room before he did his interview. My friend and I could not stop laughing at him because it is hard to look in the eyes of the person who just his hot dog nibbled off of him. And yet that was not the most awkward meeting I had with a celebrity. Shaq is swimming with the sharks! It is Shark Week on Discovery this week, and they got Shaq to do something he has never done. That thing is to go underwater snorkeling and swim with some sharks. He might be over 7′ tall, but there are still things that scare him. Not Hakeem Olajuwon, Patrick Ewing, David Robinson and Rik Smits, but the great whites. As soon as one of those little sharks swam towards him, he was out of there. Then with some coaxing, he went back in and faced some more killer fishies. This time went a little better, but I doubt he will be doing it again. Which is weird because you would think they would be more afraid of him than he would be of them. After all, he is bigger than them. For 17 years, the Unabomber caused fear in the United States by sending bombs in the mail and tonight at 9p, Discovery looks into the Manhunt to find Ted Kaczynski (Paul Bettany). When I heard about this series, I thought it was going to be told as through the Unabomber’s eyes, it is not. Manhunt: Unabomber is about how the FBI looked for and eventually caught the elusive bomber. I was not expecting to like it, but I did because it is scary how bureaucracy stalled his capture. Jim Fitzgerald (Sam Worthington) is an older FBI recruit who is a whiz at profiling. Because of that he is recruited to look into the Unabomber. He comes up with a profile, but his bosses tell him to follow theirs even though it is wrong. Time goes by, new clues including manifesto come in and eventually they start to see things his way. Just because he has profile does not mean he has the suspect. What happens when he finally does? You do not want to miss this 8-part series to find out. Imagine trying to find someone who is so off the grid, there is no way to contact him, let alone find him. That is the impossible task the Federal Bureau had to deal with and yet they got their man.